click the image to get linked to the shop! Going on all the way through Cyber Monday (...I still hate that term) which is December 1st, in my Society6 Shop! 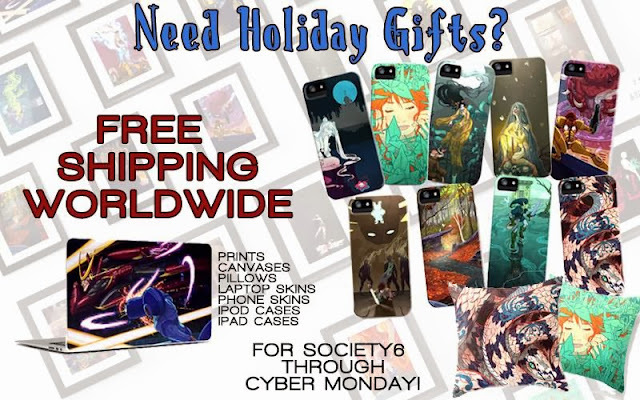 Art prints, phone cases, throw pillows, ipad skins, laptop skins, or even tote bags can make really great holiday gifts that don't even require you to leave the comfort of your home. Spend more time with your family this way! Powerpuff Girls 15th Anniversary Show! 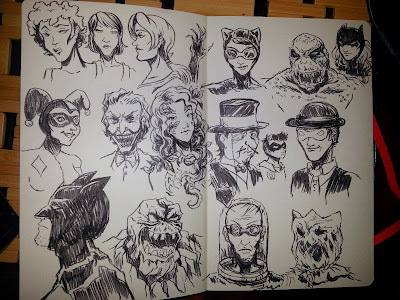 You can view all of the awesome illustrations for this show on this blog here! I really hate using brush pens so I may as well try practicing with them more often. What started off as moody lady doodles turned into Batman villains because I'd recently finished playing Batman: Arkham Asylum, as well as having BatKid save Gotham City (San Francisco) yesterday! Lil sneak peek sketch of a thing I'm workin' on and can't talk about just yet.